Like many young teams, Cowboys learning importance of fundamentals the hard way. STILLWATER — Free throws, rebounding and staying out of foul trouble aren’t always the sexiest parts of basketball, but all provide building blocks for a young team like Oklahoma State. The Cowboys struggled in those aspects against Minnesota on Friday night, leading to a 83-76 loss. 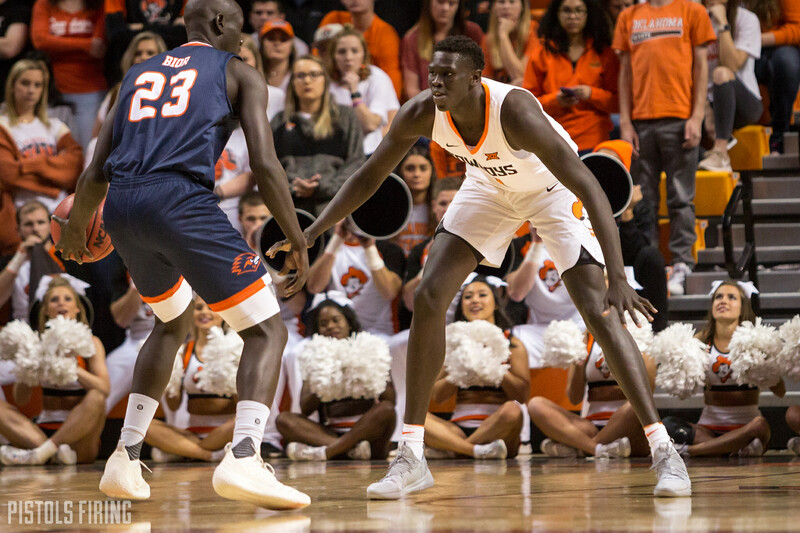 OSU was out-rebounded for the third consecutive game Friday, the Cowboys shot 50 percent from the foul line and the Pokes’ two starting bigs got in foul trouble. A lot of the Cowboys foul trouble came when dealing with Jordan Murphy, who is second in the country in rebounds per game, averaging 12. Freshman center Yor Anei has a team-high 19 blocks this season, but that is matched with a team-high 24 fouls. Against Minnesota, Anei played the lowest number of minutes of any OSU starter because of foul trouble. He ended up fouling out with 6:42 left, while Murphy went on to finish with 16 rebounds. On Tuesday, Anei said he gets in foul trouble because of his shot-stuffing mentality, but he has been working on staying more vertical in practice. OSU coach Mike Boynton said it’s a part of the game all freshmen need to learn. The Cowboys’ foul troubles obviously didn’t help with their rebounding, but Boynton said he likes more of a rebound by committee approach. He said he wants his guards in on the effort, and he said the team has enough athleticism that guards can secure the ball and still get down the floor fast enough. Freshman point guard Isaac Likekele and junior Lindy Waters have each shown their capabilities on the boards. Waters has the second most rebounds on the team this season with 36, and Likekele is behind him with 32. The Minnesota loss was also the second time this season OSU shot 50 percent from the foul line. The team has also put up impressive foul-line performances, shooting 80 percent against LSU, 79 percent against Charlotte and 78 percent against Memphis. Against the Golden Gophers, OSU freshmen went a combined 3-for-11 (27 percent) from the foul line. Struggles like these come with having a roster with six freshmen. The Cowboys have shown how good they can be in wins against LSU and Memphis, but losses like Minnesota are all a part of the young team’s process. “Because we have good kids, I don’t worry their intent,” Boynton said. “I just worry about their mental capacity to actually do it consistently. They want to do the right thing, and they think while they’re on the court that they did the thing that I’m telling them they didn’t do.